Investors are good at picking cheap funds. We want them to be better at picking funds with good stocks. Both are required to maximize success. 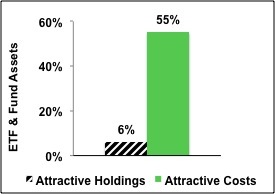 Figure 1 shows that 55% of fund assets are in ETFs and mutual funds with low costs but only 6% of assets are in ETFs and mutual funds with Attractive holdings. This discrepancy is astounding. These issues are related, in my opinion. If investors had more insight into the quality of funds’ holdings, I think they would allocate a lot less money to funds with poor quality holdings. Figure 2 shows investors are not putting enough money into ETFs and mutual funds with high-quality holdings. Only 590 of 7278 (6% of assets) of ETFs and mutual funds allocate a significant amount of value to quality holdings. 94% of assets are in funds that do not justify their costs and over charge investors for poor portfolio management. Figure 3 shows that Investors successfully find low-cost funds. 55% of assets are held in ETFs and mutual funds that have Attractive-or-better rated Total Annual Costs, my apples-to-apples measure of the all-in cost of investing in any given fund. Out of the 7,278 ETFs and mutual funds I cover, 1,197 (55% of all assets) earn an Attractive-or-better Total Annual Costs rating. Fidelity Salem Street Trust: Spartan Real Estate Index Fund (FSRNX) is one of many funds with low costs but a Very Dangerous Portfolio Management rating. It gets an overall predictive rating of Very Dangerous because no matter how low its fees, I expect it to underperform because it holds too many Dangerous-or-worse rated stocks. Low fees cannot boost fund performance. Only good stocks can boost performance. One of the Dangerous-or-worse-rated stocks held by FSRNX is Health Care REIT, Inc. (HCN), to which it allocates over 3% of its value. The company has misleading earnings, dismal returns on invested capital (ROIC), negative cash flow, and an expensive valuation. To justify its current valuation (~$60.75), HCN must grow after-tax profits (NOPAT) at 13% compounded annually for 36 years. HCN’s poor past performance and high expectations offers investors a poor risk-reward trade-off. Out of the 79 stocks held by FSRNX, none earn my Attractive rating. One has to wonder how the manager failed to pick at least one good stock. Figure 4 shows that 5% of ETF and mutual fund assets are allocated to funds with low costs and high-quality holdings according to my Predictive Fund Ratings, which are based on the quality of holdings and the all-in costs to investors. Note the fund industry offers 2,882 Dangerous-or-worse ETFs and mutual funds compared to just 245 Attractive-or-better ETFs and mutual funds, nearly 12 times more bad funds than good funds. That means a lot of fees are being paid to managers that do not deserve them. Investors deserve forward-looking ETF and mutual fund research that assesses both costs and quality of holdings. For example, Manning & Napier Fund, Inc. : Dividend Focus Series (MDFSX) is a fund with both low costs and an Attractive Portfolio Management rating. Two of the good stocks held by MDFSX are Exxon Mobil Corp (XOM) and Bristol Myers Squibb Company (BMY). Both stocks earn my Very Attractive rating. They have positive or rising economic earnings, high ROICs and cheap valuations. XOM’s current stock price (~$82/share) implies profits will permanently decline by 37% when our model shows rising economic earnings in 2011. BMY’s current stock price (~$36/share) implies the company’s NOPAT will permanently decline by 40%. Both of these stocks offer Attractive risk/reward because the expectations in their valuations are low and their economic earnings are strong. I do not know, but I do know that the lack of transparency into the quality of portfolio management provides cover for the ETF and mutual fund industry to continue to over charge investors for poor portfolio management. How else could they get away with selling nearly 12 times more Dangerous-or-worse ETFs and mutual funds than Attractive-or-better? John Bogle is correct – investors should not pay high fees for active portfolio management. His index funds have provided investors with many low-cost alternatives to actively managed funds. However, by focusing entirely on costs, he overlooks the primary driver of fund performance: the stocks held by funds. Research on the quality of portfolio management of funds empower empowers investors to make better investment decisions. Investors should no longer pay for poor portfolio management. Disclosure: I own XOM. I receive no compensation to write about any specific stock, sector or theme.